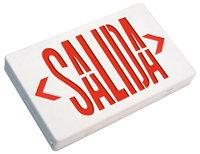 Our signature SALIDA Exit Signs meet code and make a difference. This lighted Exit sign features ultra-bright LED lamps for the most dependable visibility in an emergency. • This sign is double-faced standard. • Exit sign includes universal knock-out chevrons and SALIDA faceplates. • Features include sturdy, thermoplastic housing and is completely self-contained.